Lead Paint is likely to be found in what age of house? Lead Paint is found in approximately three-quarters of the homes built before 1978. As a general rule, the older a home, the stronger the risk of lead paint. Lead paint used in most homes built before the 1950s had higher concentrations of lead, with lower levels of lead used until 1977. In 1978, the U.S. Consumer Product Safety Commission banned the use of lead paint in housing. On April 22, 2008, EPA issued the Renovation, Repair and Painting Rule. It requires that projects disturbing lead paint be done by EPA certified renovators. Large fines can be given for not complying with the rule. 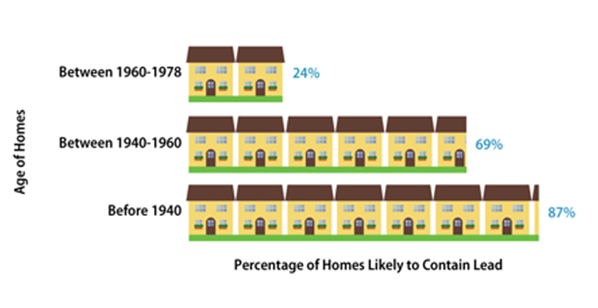 Percentage of Homes likely to contain lead. Lead paint may be found on any surface but is most commonly found on exterior painted surfaces, interior woodwork, doors, and windows. When properly maintained and managed, this paint poses little risk. Lead paint that peels or deteriorates is especially risky; friction surfaces (windows and window sills, doors and door frames, and stairs and railings) are also a concern. A lead paint myth claims that children must eat lead paint chips to develop lead poisoning. People are exposed to lead through the lead paint chips and flakes you can see, and also through the fine dust that forms. This dust gets on carpets, floors, furniture, toys and other objects, as well as on the hands of children and adults in the home. The lead is ingested when the lead dust on their hands is transferred by touch to their mouths. The only way to positively identify lead paint is by using a test kit. As with any test, false readings are possible. The EPA approved test kits have high accuracy. You may want to repeat the test to ensure accurate results.